I had a bit of leftover pizza dough and some roasted peperonata to use up. So ........ Pizza Peperonata it was! It turned out so good that I made it again for a potluck. Before I could finish saying "Mangia, Mangia! ", the pizza disappeared very quickly ;P! You can use either of the pizza doughs - the overnight cold-rising Pizza Dough or the quicker Pizza Dough II. 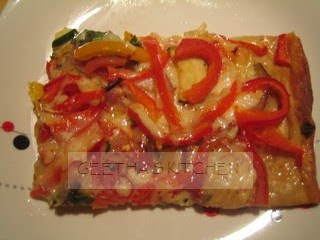 Use your own favorite veggie combination instead of the peperonata if you like. I added a lone zucchini that was lurking in the bottom of the fridge. Preheat the oven to 450 degrees F. Lightly oil a 15" x 10" baking sheet. Lightly brush the pizza dough with a little olive oil. Bake for about 10 minutes. 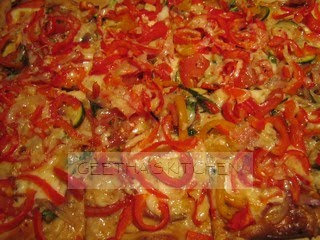 Spread the cheeses evenly on the pizza, distribute the veggies, and sprinkle salt, oregano, and chili flakes on top. Bake for an additional 10 minutes or so until the crust is golden and toppings are bubbly. Slice into desired size pieces and sprinkle with the basil, arugula and olives.